The first iteration of Charmed, which aired for eight seasons on The WB and The CW in the late 1990s and early 2000s, was often written off as a naïve, almost box-checking spin on feminism and female bonding, wrapped in silk camis and low-rise jeans: Three sisters, each with her own unique power, stick together through thick and thin to vanquish demons with impeccably timed rhyming couplets. The fact that two of the original’s stars—Alyssa Milano and Rose McGowan—are now best known as activists and sexual assault survivors is just one example of how much we underestimated it. 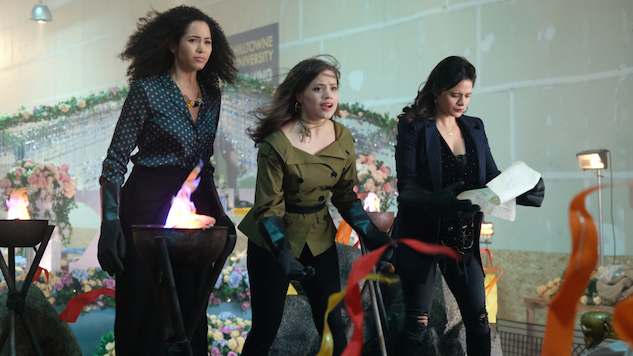 Which might explain why the revamped Charmed, which premiered last month on The CW, has attracted such scrutiny, from skeptical fans, critics, and even original cast member Holly Marie Combs, who criticized the reboot for ageism: Between respecting the legacy of the original and responding to our own political moment, the three new Charmed ones have to be the wokest witches in all the land. Thankfully, so far, they deliver. The first episode name-checks trailblazing author and cultural critic Roxane Gay, and much of the early part of the season deals with the ramifications of a female college student’s decision to stand up to a powerful male professor. (Because this is Charmed, he’s—naturally—a demon who siphons the energy of strong-willed women). Although two of the sisters were raised together, each of the three has a different father, and all are played by women of color. Still, the pair tries to approach sensitive topics with tactfulness and respect. For instance, it was recently revealed that eldest sister, Macy (Madeleine Mantock), is a 28-year-old virgin. Though this is a soapy drama, and the writers will most certainly be playing this storyline out, Rardin and O’Toole say they’re careful not to make Macy’s virginity a factor that humiliates her. Rardin and O’Toole acknowledge that there’s a liberal subtext at play in the new Charmed. Macy, for example, is a woman of color working in a STEM career, meaning she’s both a role model to younger viewers and a way to challenge stereotypes that older viewers may be accustomed to seeing on screen. Sometimes these messages are unintentional; despite the way it looks so far, not all of the demons on Charmed will take the shape of white men. And, unlike Gina Rodriguez’s title character on Jane, these women are not always going to be the moral center of the show. They are newly minted witches and therefore very, very fallible. The most recent episode, “Exorcize Your Demons,” was the first to show that the sisters can’t save everyone when a well-meaning police officer died as a result of their actions. This guilt and pain carries into the upcoming fifth episode, “Other Women,” with particular repercussions for middle sister Mel (Melonie Diaz). All of this it say that yes, the Charmed co-creators do find it frustrating that their work isn’t taken as seriously as other series in other genres. “I do feel like any show that sounds quote-unquote ‘girlie’ is considered less prestigious,” says O’Toole, whose credits with Rardin also include The CW’s The Carrie Diaries and Greek, which aired on what was then called ABC Family. They also worked on ABC’s Selfie, an adorable show that was beloved by critics, but also one that O’Toole says was plagued from the moment people heard its title “because selfies are associated with teenage girls, and we tend to disparage things that are associated with teenage girls.” She says the first Charmed, of which she was a fan, also fell victim to this. But perhaps all of this is changing. Witches—particularly teen and young-adult witches who appreciate a campy one-liner—are all the rage now, as Charmed, The CW’s Legacies, and Netflix’s Chilling Adventures of Sabrina join the likes of FX’s American Horror Story. The Charmed showrunners promise there’s no rivalry with Sabrina creator Roberto Aguirre-Sacasa, even if they do share a network with his other show, Riverdale; the more strong female characters the better, they say. Rather, Rardin would like to look at why they’re all employed on these projects right now. So does that mean every witch who appears on Charmed will be using her powers for good? Eh… the co-creators say to look for characters who fall into a moral gray area. And just how many fit this description may have recently increased; on Thursday, the network announced that the show’s first season will be a full 22 episodes. Charmed airs Sundays at 9 p.m. on The CW.